Color reproduction of a photograph of Clementine Hunter on Melrose Plantation, in Natchitoches, Louisiana, in the 1960s. 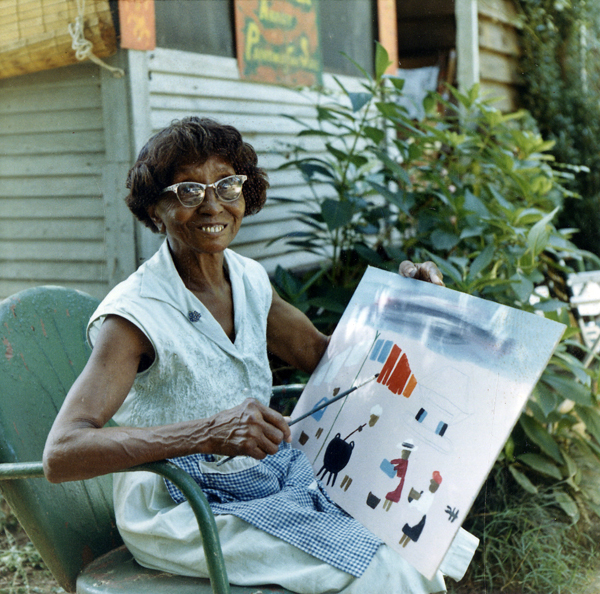 Largely self-taught, African American artist Clementine Hunter chronicled life in the Cane River region during the early and mid-twentieth century. 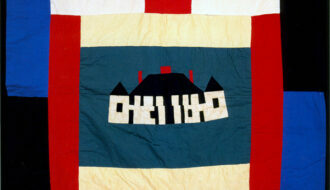 Though she did not begin painting until age fifty, she produced more than five thousand pieces of work, including about two-dozen quilts and narrative textiles. She gained great renown as a “folk” or “self-taught” artist before she died, though the meaning of those terms continues to be debated. 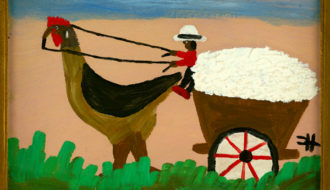 Many of her paintings depict people and events at Melrose Plantation in Natchitoches Parish, a cotton plantation along the Cane River where she worked for most of her life. 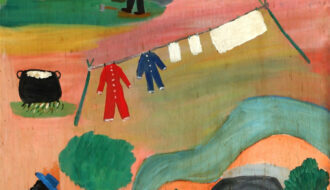 Hunter is perhaps best known for the nine room-size murals she painted on the walls of the African House, an outbuilding in the Melrose plantation complex. Clementine Reuben was born in 1886 or early 1887 on Hidden Hill Plantation (also known as the Little Eva Plantation) in Natchitoches Parish. She was the eldest of seven children born to Mary Antoinette Adams and Janvier (John) Reuben, both French-speaking Creoles of color. The family moved to Cloutierville when Clementine was five or six years old. She attended school for only a short time, preferring to work instead. When she was fourteen or fifteen, her father found work near Melrose Plantation. There, Hunter began picking cotton as a field hand. She eventually became a cook, laundress, and nanny to the plantation owners’ children. Hunter had two children with Charles Dupre before she married Emmanual Hunter in 1924. The couple went on to have five more children. Hunter’s artistic career began while she was employed at Melrose. Carmelite “Cammie” Henry, owner of the plantation following the death of her husband John Hampton, welcomed artists of all types to the rural estate, eventually transforming it into an artists’ colony. Hunter’s contact with the artists who resided at Melrose eventually inspired her to begin “marking” pictures. Francois Mignon, a friend of Henry’s who served as the curator/librarian at Melrose, proved particularly supportive of her art. Mildred Hart Bailey and Ora Garland Williams, professors at nearby Northwestern State University, also showed an early interest in her work. Hunter’s other patrons included Ann Williams Brittain and Thomas N. Whitehead of Natchitoches and writer James Pipes Register, who lived in Norman, Oklahoma. Register, although not wealthy, paid Hunter a small monthly stipend, sent her supplies, and used his contacts to organize exhibitions of her work. In 1945, he secured some money for Hunter from the Julius Rosenwald Foundation, a charity founded by the president of Sears-Roebuck, who took particular interest in the plight of African Americans. 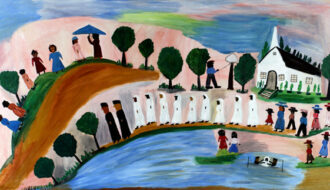 Hunter’s art frequently depicts the lives of African Americans in the Cane River community. She painted on all kinds of surfaces, including discarded objects: cardboard, bottles, plastic containers, window shades, buckets, even the occasional ironing board. As indicated by the titles of some of her works — Washing Day, Fishing, Saturday Night, Blessed Martin Chapel, Cotton Crucifixion,Black Jesus, Pecan Threshing, Melrose Complex, and Cane River Funeral — she painted people at work and at play, doing household chores, worshipping, dancing, and socializing. The prominence of revival meetings, weddings, wakes, funerals, and crucifixion scenes in her paintings indicates the importance of religion to the Creole community. Women also figured large in her work, both literally and figuratively. She depicted strong African American women active in many aspects of traditional country life: working and playing outdoors, marrying, tending to children, nursing the sick, attending church, and laying the dead to rest. Her angels are female, Mary appears with the baby Jesus, and even Jesus occasionally appears to be female. Almost all her figures are African American. Hunter was motivated to make art until the last few months of her life. “God gave me the power,” she said. “Sometimes I try to quit paintin’. I can’t. I can’t.” An article on Hunter appeared in Look magazine in June 1953, giving her national exposure. In 1955, she became the first African American artist to have a solo exhibition at the Delgado Museum (now the New Orleans Museum of Art), and President Jimmy Carter invited her visit the White House. She died January 1, 1988, in Natchitoches. Her work is in the collections of the Dallas Museum of Fine Art, the American Folk Art Museum, Minneapolis Institute of Arts, the Ogden Museum of Southern Art, the New Orleans Museum of Art, and the Louisiana State Museum. Though Hunter sold her paintings for as little as 25 cents in her earliest years as an artist, her works are now priced in the thousands of dollars. In October 2007, Neal Auction Company of New Orleans set a record price for a work by Hunter with Cane River Baptism, which sold for $19,980.00. Allured, Janet "Clementine Hunter." In https://64parishes.org Encyclopedia of Louisiana, edited by David Johnson. Louisiana Endowment for the Humanities, 2010–. Article published September 12, 2012. https://64parishes.org/entry/clementine-hunter. Gasperri, Robert. Clementine Hunter: A Sketchbook. New Orleans, LA: Ogden Museum of Southern Art, 2014. Shiver, Art, and Tom Whitehead. 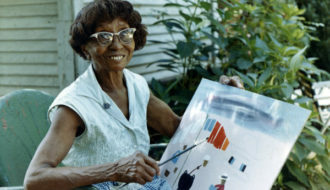 Clementine Hunter: Her Life and Her Art. Baton Rouge: Louisiana State University Press, 2012. Gilley, Shelby R. Painting by Heart: The Life and Art of Clementine Hunter. Baton Rouge, LA:: S & Emma Press, 2000. Hunter, Clementine. Talking with Tebe: Clementine Hunter, Memory Artist, ed. Mary E. Lyons. Boston, MA: Houghton Mifflin Company, 1998. Kogan, Lee. 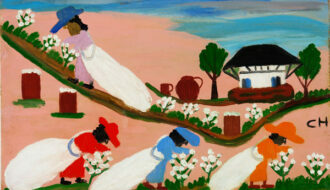 “Clementine Hunter: Self-Taught Louisiana artist.” In Louisiana Women: Their Lives and Times, ed. Janet Allured and Judith Gentry, pp. 175–194. Athens and London: University of Georgia Press, 2009. Wilson, James L. Clementine Hunter: American Folk Artist. Gretna, LA: Pelican, 1988.